Just now a hacker with twitter handle @SQLiNairb claims to hack washingtonnetworkgroup.com, a website which is a membership organization of professionals in business, finance, technology, foreign and government affairs, established in 1995. He claims to hack the website SQLi and leaked all the login credentials which contains email from multiple domains like Gmail, yahoo and others but it also contains .gov emails of U.S govt. 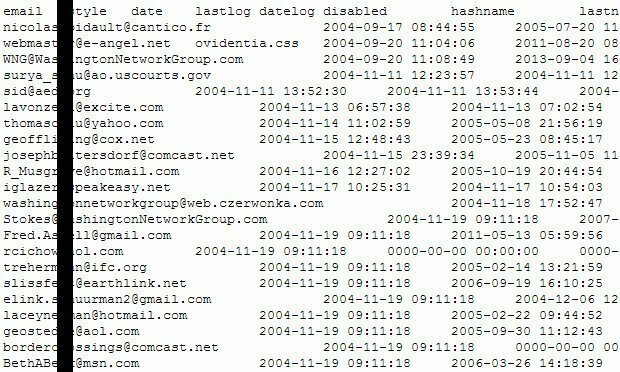 After a recheck we found 100+ .gov emails credential were there. Remote Address & Much more personal, technical info. Just after the tweet, the leak link he gave us was removed, however we managed to see the cache of the leak link and found the all the details posted. We also googled the data and found it was released back in June but none of the site covered this leak, it may be a genuine but we still keep this news under review.